From left to right: Aidan Henderson, Lauren Robertson, Emily Burns and Steven Park. 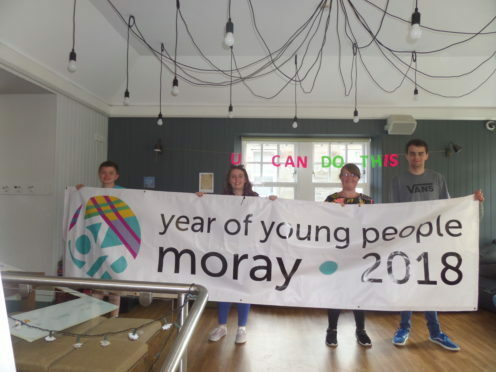 A Moray youth charity is holding an Inspiration Week to celebrate young people, diversity and achievements. The Elgin Youth Cafe has organised a series of events during the school October holidays as part of Scotland’s Year of Young People celebrations. There will be talks from a series of famous names, including a Commonwealth Games athlete and a Rio 2016 Paralympic medalist. Hammer thrower Mark Dry has won two bronze medals at the Commonwealth Games and will talk about his successes and how injuries have affected his career. He has gone through two hip reconstructions, but remains determined to return for the Tokyo 2020 Olympic Games. Paralympian Steve Bate will talk about his career in para-cycling, including his success at the 2016 Paralympics where he won two gold medals and broke the world record in the 4k pursuit. Mr Bate was diagnosed with retinitis pigmentosa in late 2011 and was officially registered blind. These two events form part of a varied programme, arranged by Moray young people to inspire people to chase their dreams. Emily Burns, 17, has been involved in the planning stages since the start of the year and is excited about how it is all coming together. She said: “Inspiration Week 2018, is about getting young people to inspire young people. It is about celebrating young people; diversity, inclusion and their many different achievements. “This includes getting young people from Moray and other people from all over the world, to inspire young people to reach their full potential, challenge themselves, try something new and realise what they can achieve. Elgin Youth Cafe received £10,000 from the Scottish Government’s YOYP initiative to put on the Inspiration Week. It is running from Saturday, October 13 to Saturday, October 20 with a variety of activities to inspire the local youngsters. The week concludes with an all-day music festival and talent showcase.